The panels were part of a long frieze placed high on the walls of a religious building. They carry quotations from the Qur’an. One reads, ‘Our Lord, You have not created all this without a purpose – You are far above that! – so protect us from the torment of [the Fire]’. They were originally painted in bright colours, which made the words easier to read. Five rectangular panels of pine from a frieze. Each is carved with a single line of Arabic against a background of leafy scrolls, covered with gesso and painted. The frieze from which these panels came contained lengthy quotations from the Qur'an. The text on 378-1904 is part of verse 256 of the surah al-Baqarah (II). The text on 378A-1907 is the word /al-naar/ followed by the beginning of verse 255 of al-Baqarah. The word /al-naar/ does not occur at the end of verse 254, and so the frieze must have contained a selection of verses rather than a single sequence. Note that /al-naar/ is the last word of verse 191 of the surah Al 'Imran (III), part of which is found on 378C-1907. The text on 378B-1904 is the beginning of verse 164 of al-Baqarah. The text on 378C-1907 is part of verse 191 of Al 'Imran. That on 378D-1907 is part of verse 257 of al-Baqarah. For a proposed reconstruction of the original colour scheme of the panels, see Shayne Rivers's contribution to The Making of the Jameel Gallery, especially p.111, illus. 5.12. NB Valuation of 01/07/2004 is for parts A&B only, as only these were sent to the Palace & Mosque travelling exhibition. For the purposes of the exhibition, and therefore the valuation, parts A&B were considered as a whole object. In early 2005, a number of short field trips were undertaken by individual curators to Istanbul, Cairo and Morocco. ... 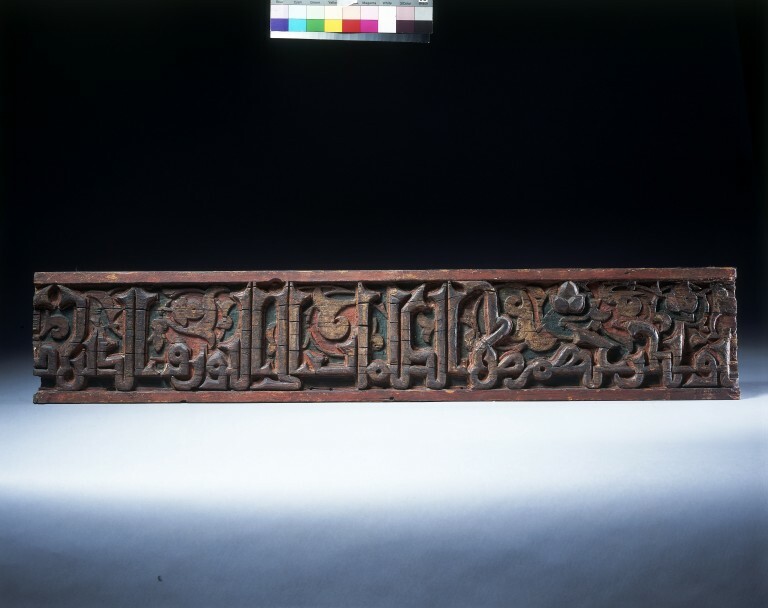 In Morocco, Mariam Rosser-Owen carried out more sustained research on six sections of a wooden calligraphic frieze in the V&A’s collection (illus. 5.11). Panels of this type have been described at various times as Moroccan, Spanish, Syrian, and Egyptian, but initial research pointed to Morocco as their most likely provenance, since inscribed woodwork is a key feature in religious architecture there. Parallels, at least in terms of the Kufic style of script employed, were indeed found in the carved woodwork on monuments of the early fourteenth century in Fez. One example is the Funduq al-Tastawniyyin, which provided lodgings and a place of business for merchants from Tetouan (illus. 3.27). The background decoration in these fourteenth-century examples was, though, much more elaborate and much denser. The same was true of the Kufic inscriptions in stucco and cut tile-work on 14th-century buildings of Fez. It was therefore necessary to find earlier parallels, from the Almoravid and Almohad periods (1055–1147 and 1147–1269 respectively), of which the Almohad city gates still standing in Marrakesh and Rabat are a magnificent example. These were built between 1150 and 1200 and feature long Kufic inscriptions that form the three sides of a square frame around the gates’ main arch (illus.3.28). The form of the script and the sober use of simple floral motifs provide the closest parallel to the design of the V&A’s wooden beams. These can therefore be attributed to Morocco in the Almohad period. Research by Mariam Rosser-Owen reported in Tim Stanley, "The Concept of the Jameel Gallery", in The Making of the Jameel Gallery of Islamic Art at the Victoria and Albert Museum, edited by Rosemary Crill and Tim Stanley, London: V&A Publications, 2006, pp.70-73. The David Collection in Copenhagen has a panel identical to these, in terms of their dimensions, the calligraphic style of the inscription, the carving of the floral scrolls in the background, and the colouration of the whole in red, green and white paint. It would not be surprising if they came from the same monument. The David Collection panel is accession number D12/1986, and is published in Kjeld von Folsach, Art from the World of Islam, in The David Collection (Copenhagen, 2001): cat.no.430, p.268. Its caption is: "Panel, wood, carved and painted. H: 17; W: 103 cm. North Africa or Syria, 12th century". Two very closely related panels have recently been sold at Christie's, St James's, London: the first on Tuesday 23 April 2002, and the second (in two pieces) on Tuesday 29 April 2003. These panels are contiguous, though they were sold at separate sales (the panel sold in 2002 immediately precedes that sold in 2003). They have the same calligraphy, though the uprights of the letters are more elongated, and the same scolling floral motifs in the background. They are much larger however: the dimensions of the 2003 panel are H: 27 x L: 314 cm. The catalogue article relates the particular bifurcating leaf and bud motif on the beams in the V&A and the David Collection to the decoration of monuments in Spain and North Africa (the Maghreb), mostly from the Almoravid and Almohad period, but also continuing into the Nasrid and Marinid periods. For example, they are found in the inlay on the steps of the minbar in the Kutubiyyah mosque in Marrakesh, on the great Almohad gates in Rabat and Marrakesh, and on the spandrels of the Salón de Comares in the Alhambra. And the dislike of (the love of death) makes their time of death lengthened". 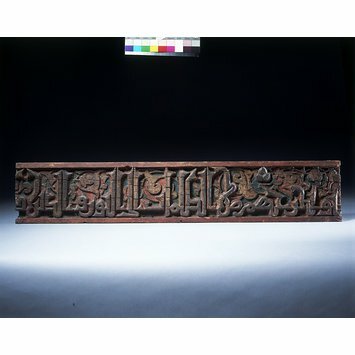 These beams, of which the V&A has six in its collection, have inscriptions from the Qur’an carved in high relief in an elegant version of 'foliated Kufic' script, and a background decoration in a much lower relief, which is covered in gesso and painted in green, red and white paint. This style of inscription, as well as the particular form of the scrolling leaf and bud motif in the background, is seen on many monuments still standing in Spain and Morocco, dating mainly from the Almoravid (ca. 1062-1150) and Almohad periods (1150-1269). The use of verses from the Qur’an in the inscriptions on these beams suggests they originally formed part of the decoration of a religious foundation, such as a mosque or madrasah. They were probably part of a continuous frieze of Qur’anic quotations. Such friezes often ran around the tops of walls. This is the arrangement, for example, in the Dome of the Rock (Jerusalem), the Great Mosque of Córdoba, and in the Mosque of Ibn Tulun in Cairo, where a wooden frieze similar to these originally ran to a length of over 2 km. Set of wooden panels carved with Qur'anic inscriptions in foliated kufic script, the background painted with a scrolling palmette design. Almohad Spain or Morocco, 1150-1250. The panels were part of a long frieze placed high on the walls of a religious building. They carry quotations from the Qur'an. One reads, 'Our Lord, You have not created all this without a purpose - You are far above that! - so protect us from the torment of [the Fire]'. They were originally painted in bright colours, which enhanced their legibility.